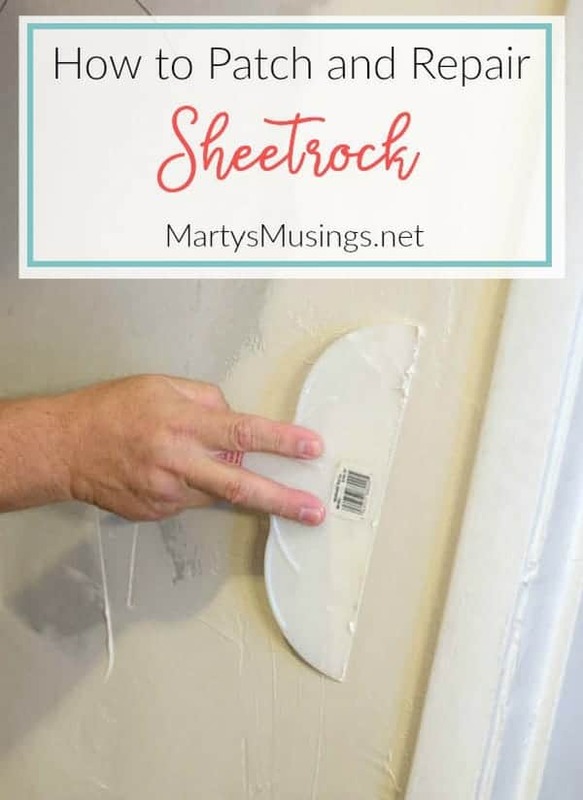 Step by step instructions on how to patch and repair sheetrocking, a must read for fixing holes, gaps and other imperfections in your walls! 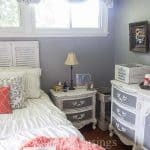 Those of you who have been reading my blog for a while know of the many home improvements we’ve made over this past year. My DIY hubby is the engineer, builder, fixer and brains behind our projects. I just send him pics of what I like and we go from there. He tells me what he thinks will work and I bat my eyelashes to get what I want. No, seriously, that doesn’t work anymore 🙂 We are a good team and there’s always lots of compromise. One of the basic improvements many homeowners need to make is patching and repairing sheet rocking. We are at the beginning stages of a kitchen upgrade/redo which basically means taking our old, outdated furniture and decor, transforming them and adding some thrifted materials to give our kitchen a whole new look. It’s definitely a work in process! 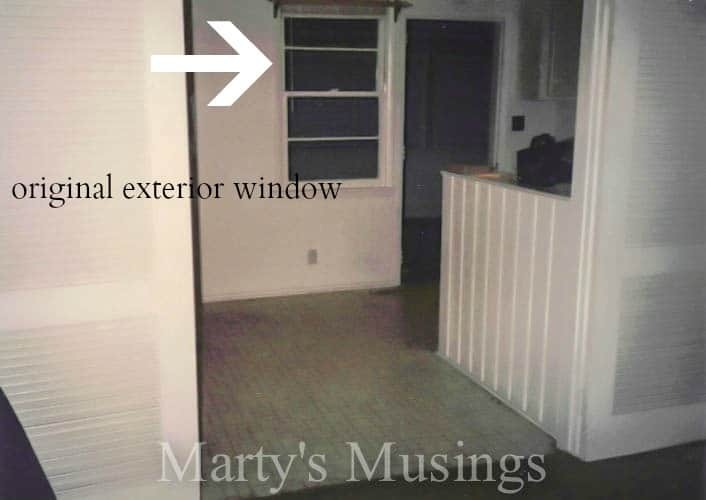 In the picture below you can see the original exterior window that was in our kitchen when we bought it. Yes, the entire house was in terrible shape and we had no idea what we had gotten ourselves into. Twenty one years later we’re still doing home improvement projects! Here’s our first after picture. Yes, it was during my country blue phase. Isn’t it just the cutest? Travel forward twenty one years and you have the same opening that has had a sheet of plywood added and painted to separate the den from the kitchen. Yes, I was slightly tea pot obsessed but I am now recovering. I now leave you in my husband’s capable hands for the rest of the project. From Tim: SO! You want to patch over a window or even just a crack in the wall? Here’s a quick tutorial on sheet rocking repair that will work for either situation. 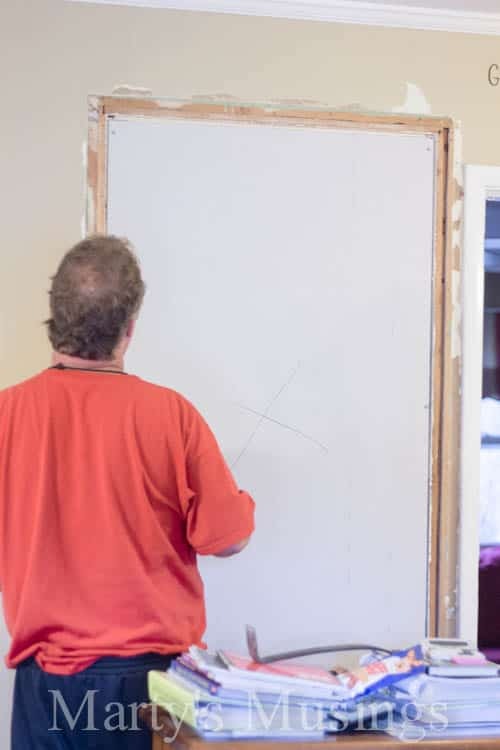 For this project, the first step was to remove all obstacles that would get in the way of framing the opening to receive sheet rock. Below, I’m just removing the shelves and cleaning the opening. The sill and casing are already gone. Tip: it’s critical to “set-up” the opening with as little transitional difference at the seams as possible. 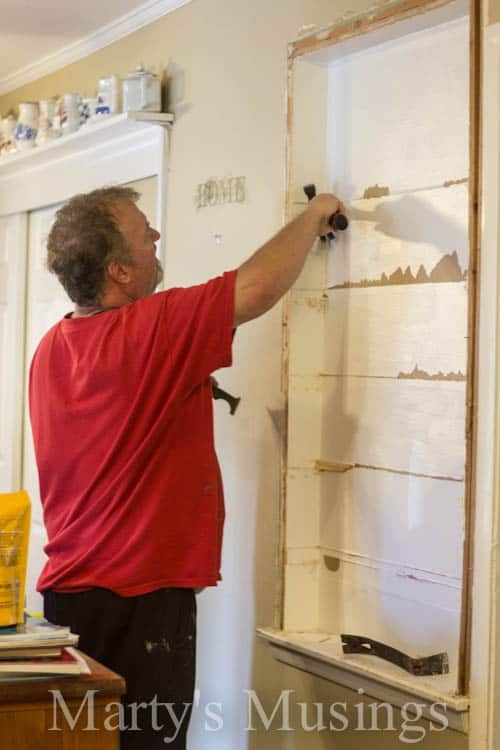 The bigger the difference now, the greater difficulty in getting a nice, smooth wall later. 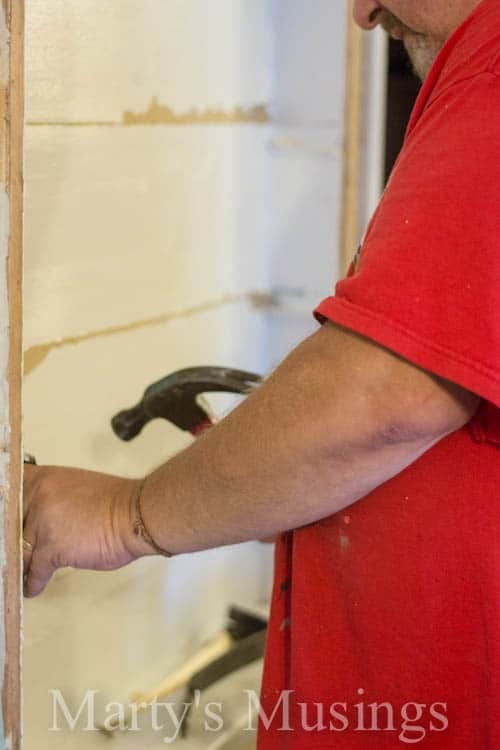 Tip: For a simple crack repair, you just scrape across the crack with a painter’s tool or spackling knife to remove the high spots. Not pictured: nail 1″ x 3″ strips all around the inside perimeter that the sheetrock would be nailed/screwed into. 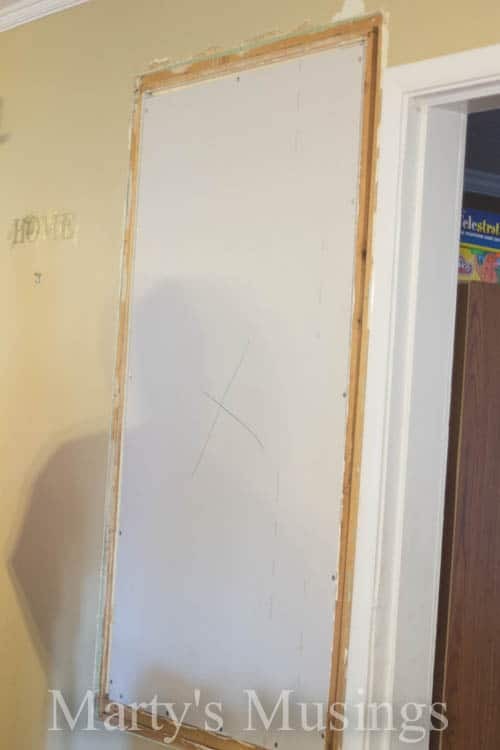 These strips were backed off the opening the exact thickness of the sheetrock so that, again, we have as even a transition as possible, even at this point. Because this was originally an exterior window (the room on the other side was added-on), it was framed as such. You can see that, on the right side, I actually had a gap to deal with, but that was not an issue. You’ll see that the spackle in the next step solved the problem. The sheet rock was screwed into those 1″ x 3″‘s I mentioned earlier. This is a better idea than banging nails and taking the chance of knocking that framing out of place. Now I began the multi-step process of spackling. 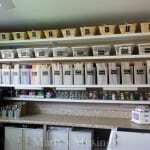 (This is the product I use.) This procedure is true for this or any spackling job you do. Tip: start out small and do NOT worry about perfection! The first run will be just enough to cover the seams/cracks. You will most likely only end up with a 2″ wide patch right now…that is just what you want. Let it dry completely. Yes, you can cheat with a hair dryer if you must but NO HEAT GUN and it has to be dry before moving on. For the final step for smaller cracks, you want to think smooth. Still not perfect here, but the better spackling job you do the easier sanding you will have in just a bit. You can see in the picture that this is still not smooth – I actually did four coats. Tip: Now, this tip might rock your world. I don’t use sandpaper! I cannot stand the thought of cleaning every room in the house because of a coating of sheetrock dust. 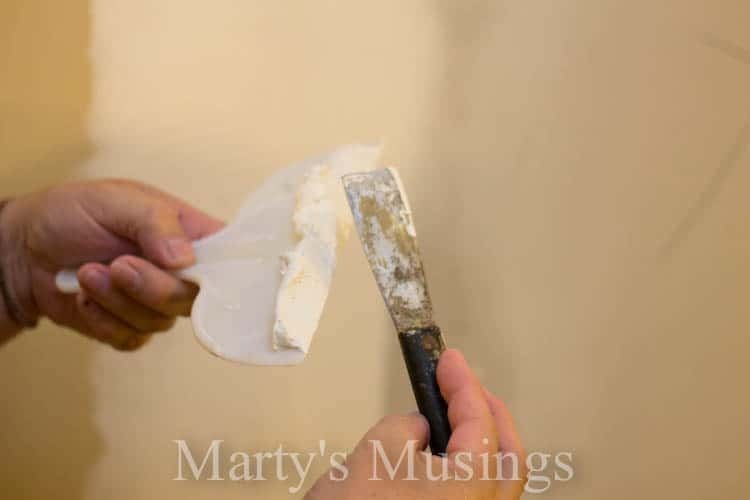 The answer is called “wet sanding.” I use a large sponge that wallpaper hangers typically use, keep it almost wrung-out (you want the water to do the work, not your elbow), and go for smooth! Can you see how wide my spackle path ended up? It is over 6″ wide total, which makes it MUCH easier to achieve perfection here. Wipe and wipe and wipe gently until you can neither see nor feel bumps or valleys. 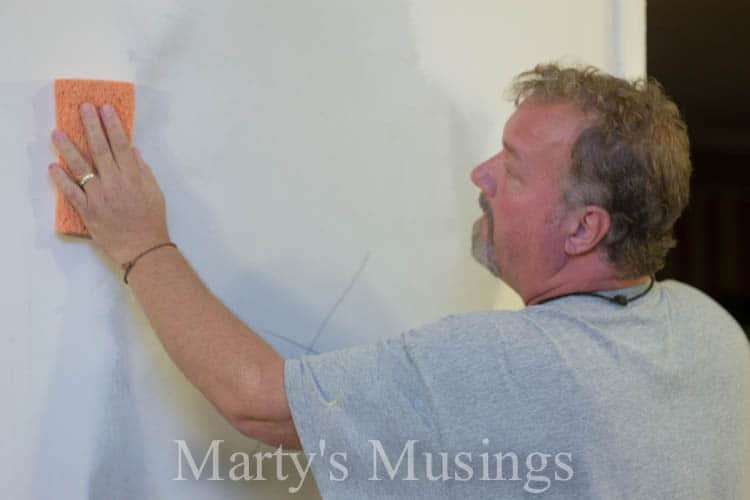 If you find that too much spackle is coming off, back off the water content in the sponge and try again. 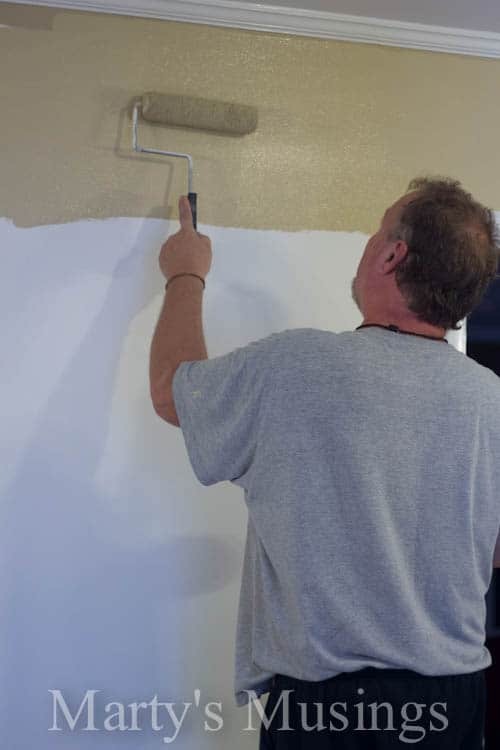 If you still have some trouble spots, re-spackle those and start again. Trust me, you’ll get the hang of wet sanding pretty quickly! You will LOVE that it is totally dust-free! Tip: When spackling, on any occasion, use TWO knives. The smaller one, a 2″ blade, will ONLY be used to scoop the goop out of the container…it never touches the wall. The bigger blade, and I usually use a metal 4″ (not the plastic 6″ in the picture), applies the spackle…it never goes in the container. This is the perfect way to keep the trash and clumps that you might pull off the wall from getting into your nice, clean mud. Scoop mud with the smaller, scrape it on the bigger blade, and apply to the wall. Anything ugly on the big blade gets removed with a paper towel. Just a quick look here at keeping even pressure on a wide blade. Remember that gap I pointed out earlier? I needed to address it again with the wide blade since I wasn’t totally happy with the result. I was glad to have that door casing to the right as a good stopping point! Take advantage of that if at all possible. So, we’re all nice and smooth with a very dry final coat of spackle and I have, again, omitted a step (double sorry). I have applied a coat of white latex primer to seal all that repair work. Tip: my choice is Killz Odorless, which is not, really. This product floats on well and dries quite fast, but it SPLATTERS like crazy. You must protect the floor before using this, or any, primer. Latex gloves are appropriate, too. Be aware that this particular product also leaves a very heavy “footprint” on the wall – that crazy orange-peel texture. If it dries with an unpleasant texture for you, regular sandpaper is necessary, or even a palm sander. It is unique to this Killz product. Two finish coats to match your existing walls and the window (or crack) is gone! 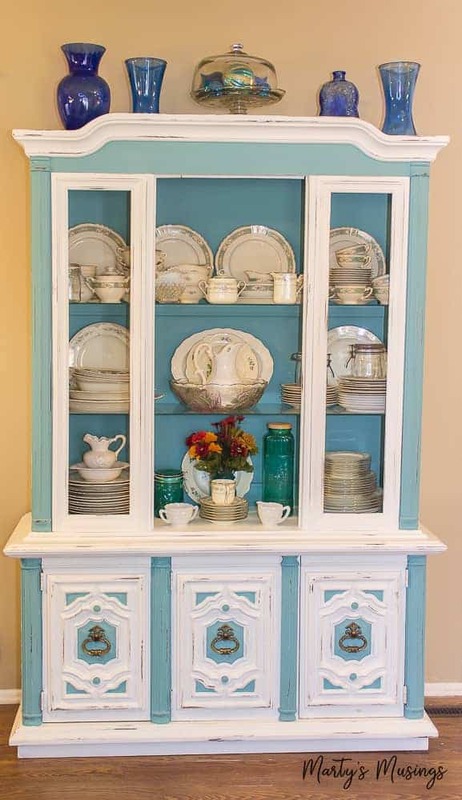 Here’s a teaser below of my next project, a chalk painted china hutch. Wait till you see it! 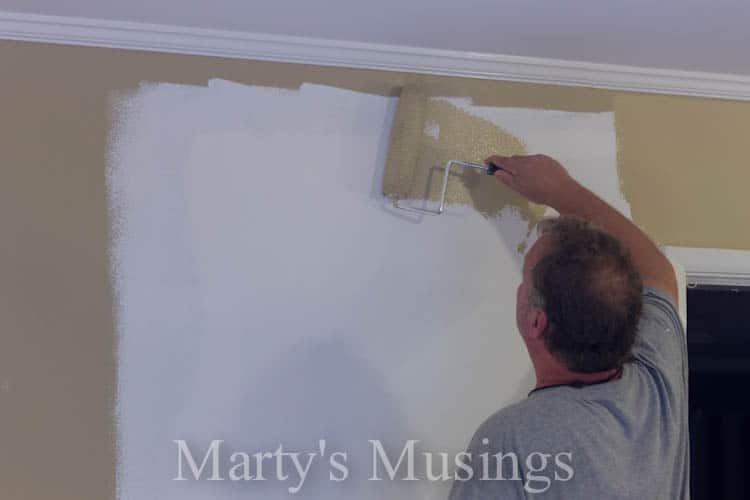 Back to Marty: My husband does a great job of taking care of our 1950’s ranch home, with plenty of opportunities to patch and repair sheetrocking all over the house! 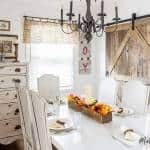 If you want to see more of our home take the home tour here or see all our DIY projects here. Way to go Tim!!!!!! I have to show this post to my hubby!!! Wow – nice to know there are still some people who are craftsmen. Really helpful post! 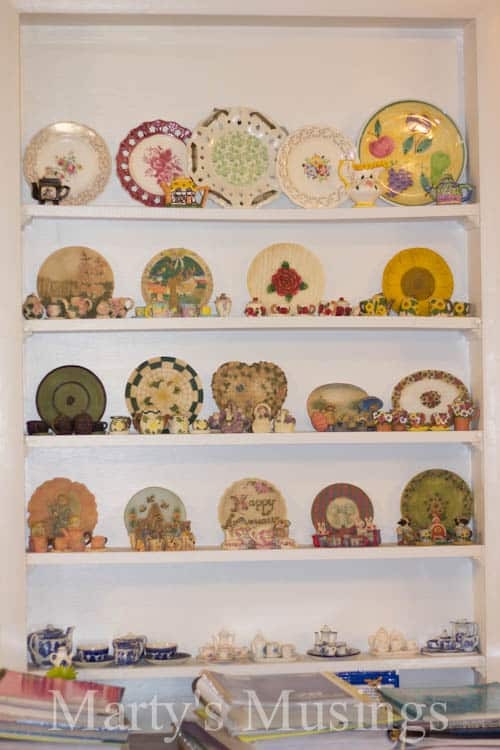 Thanks, Ellen, for visiting Marty’s Musings and our china hutch project. My husband has a great eye for details, doesn’t he? 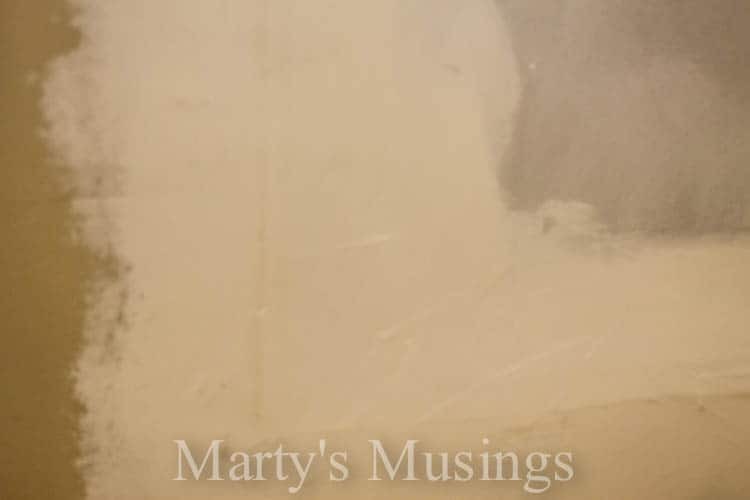 Thanks, Ellen, for visiting Marty’s Musings and our wall repair post. 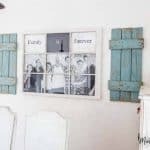 My husband is quite the DIY’er and I’ll pass on your compliment! What a wonderful team you are !!! My hubby and I are inspired by you two. Great work on the house. Great tips too. Thanks, Sheila. That’s so sweet! 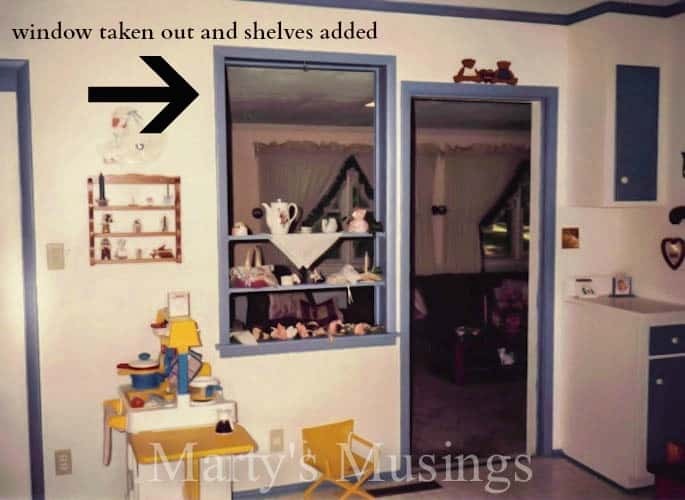 Our home is definitely a work in process…..going on 23 years! 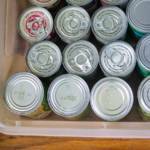 Its a amazing information Thank you for posting.. It’s really helpful post! 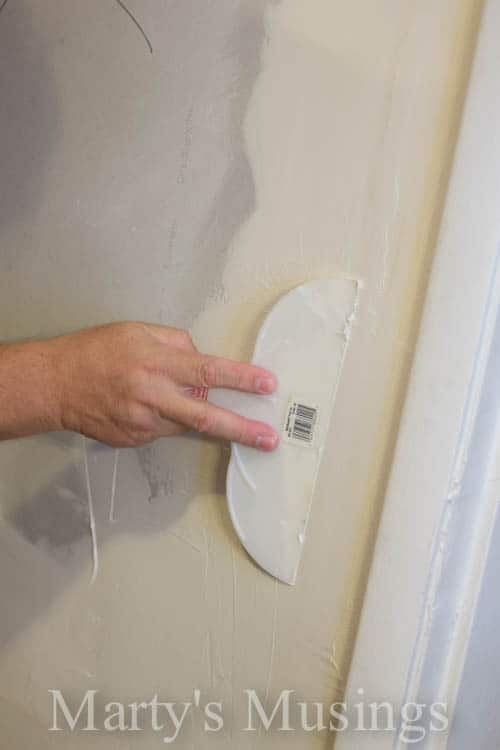 It’s good to know more about fixing drywall. The steps you have here don’t sound too difficult, like cutting the sheet rock into the right shape and things. 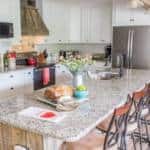 However, I don’t dare try and remodel our kitchen, so I’d rather hire a professional for all of this!